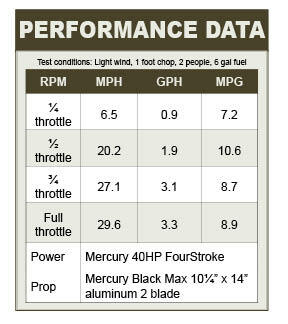 Our reviewer captured these detailed boat test notes while reviewing several of Lowe's new jon boats. 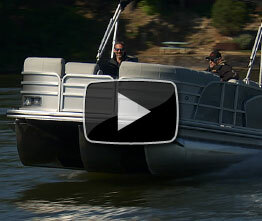 Watch the Frontier Series Video Boat Review. Filming underway on the Frontier 1756. 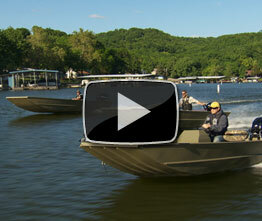 Overview: This new Jon boat design is intended to improve on the standard Lowe Roughneck Jon boats. Add a more aggressive V-shape to the boat’s entry. 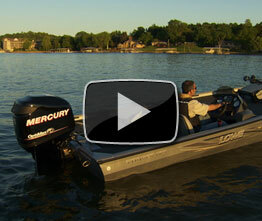 Provide the maximum value for an inexpensive, simple, no-frills utility boat. Welded .100 gauge aluminum construction. Optional Gator Skin non-skid finish. Standard aluminum deck with sealed edges, so nothing rolls underneath and gets trapped. Extra V in the entry cuts down on bumps and spray. 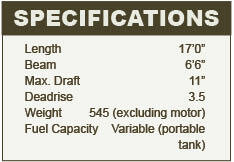 Three and a half degree deadrise improves the ride in rough conditions. 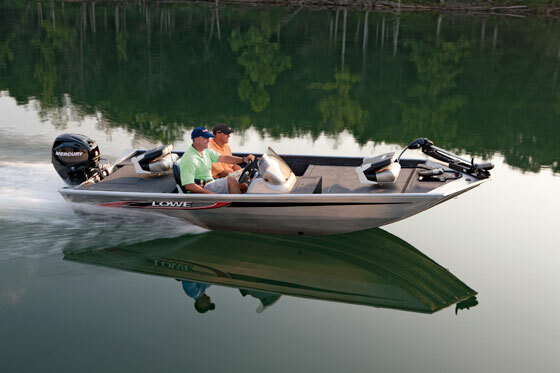 Multiple powerplant choices, as well as the option to choose tiller or console/wheel steering, gives the flexibility to offer wide-ranging performance. Light weight equals fast planing, even with small power choices. Additional V in the bottom provides a grip on the water when turning. Extruded aluminum gunwale has built-in accessory receiver. 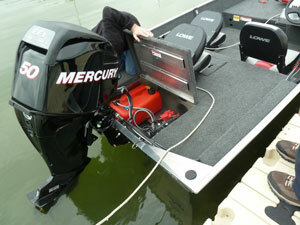 Deck cut-out at transom brace allows installation of a bilge pump below deck level. This was our favorite in the line. 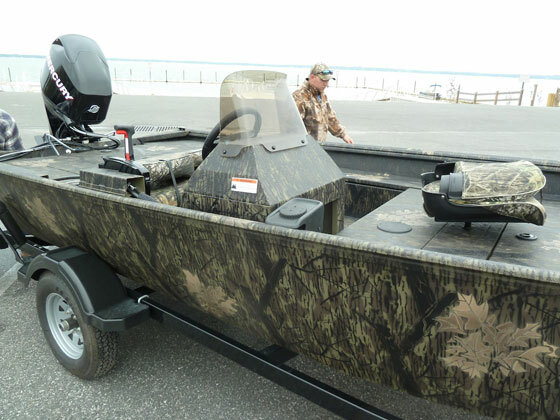 It’s large enough to suit most purposes, but not so large it becomes difficult to handle in the wind or on the ramp. 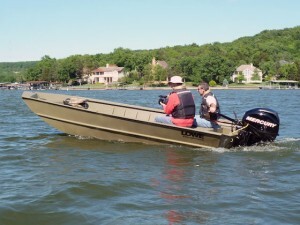 It’s also extremely inexpensive and economical to run, yet provides great performance with a 40-hp tiller-steer Mercury on the transom. 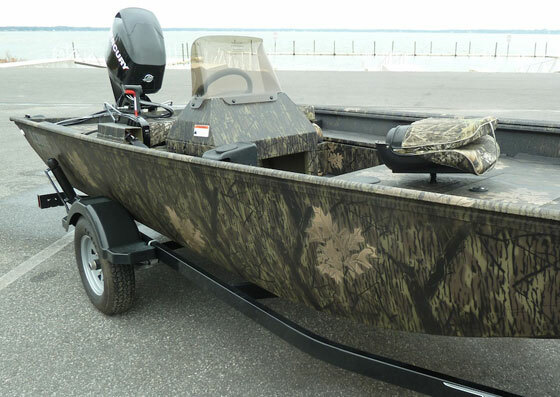 Visit the Frontier 1756 page at the Lowe Boats website.